HONOR, the leading smartphone e-brand under the Huawei Group, unveiled two unique wearable devices i.e., HONOR Watch Magic and, HONOR BAND 4 Running along with HONOR View20. HONOR Watch Magic – is a 9.8mm smartwatch, thinnest in its category featuring Touch Screen Retina AMOLED, dual-chipset low-energy consumption system, 3-satellite positioning for multiple sports mode, TruSeen™3.0 smarter heart-rate monitor and Trusleep™2.0 sleep quality smart tracking for daily activities. Pitted as the Smart Companion for users, HONOR Watch Magic is available in two colors Lava Black and Moonlight Silver priced at INR 13,999 and INR 14,999 respectively on Amazon.in. The HONOR Band 4 Running, designed specifically for runners features a 0.5” PMOLED Display, dual wearing mode (foot and hand), six-axis sensors to monitor and professionally manage the running postures is available in dual band color at INR 1599. HONOR Watch Magic is powered by industry’s first, double-chipset architecture for low energy consumption. The AI enabled low-energy algorithm recognizes the usage and pattern of the user to customize and save power and thus, deliver battery life for a week. The three satellite positioning helps achieve a faster and more accurate positioning – a feature designed specifically for sports enthusiasts. Catering to all outdoor, indoor and training mode the HONOR Watch Magic uses scientific training system ranging from an introductory to advanced professional courses. Besides, the HONOR Watch Magic also acts as a smart companion helping track daily activities, understand the sleep quality, heart-rate and thus lead a convenient life. 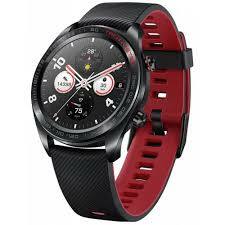 Available, in two color options Lava black and Moonlight Silver the HONOR Watch Magic comes in sports and fashion mode. The HONOR Band 4 Running offers seven types of fitness data ranging from Foot Strike Pattern & Impact, Swing Angle, Eversion Range, Step Length, Cadence and Ground Contact Time. Some of the other features that are in common are Finding Your Phone, Message & Incoming Call Notifications.